Direct Response Copywriting: Can Your Website Pass This Five-Second Test? Let's do the Five Second Test to determine how effective their web copy is. 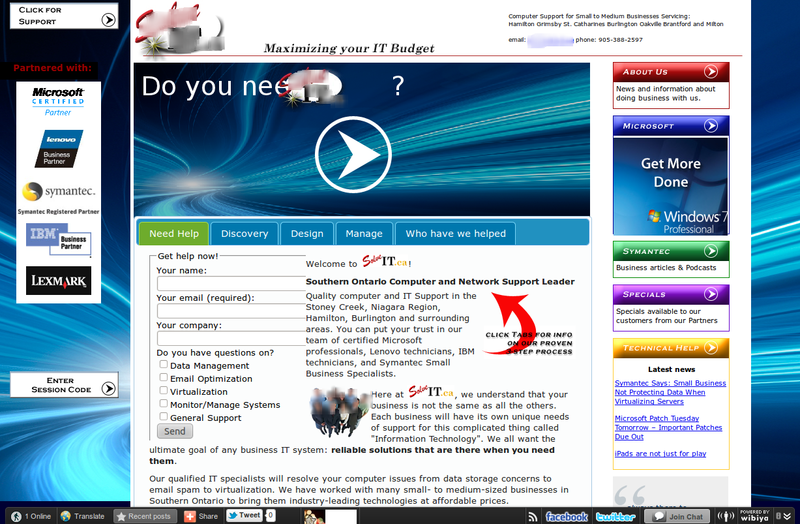 Take a look at the screenshot of the site's landing page. In five seconds or less, tell me the one benefit or solution that they offer to potential customers? Chances are, I am going to get different answers. The most common one is that they offer IT solutions. Another common answer is that the firm offers tech support. But that's too general isn't it? And there are hundreds of other websites that offer the same thing. If your site is like everyone else's, how are you going to stand out when a potential customer starts looking? Four seconds is the average time you get when a visitor finds your landing page. First their eye goes towards the most prominent image on your landing page. From there, their eye scans from the top left, going right, then down looking for keywords. When they find what they were looking for, their attention zooms in on that. If what you are saying makes sense for them, your site just earned another five seconds. Short attention spans are one more reason why your website has to load fast. If it takes a moment for your site to load, it give the impression that you are not a professional. Do whatever it takes to lighten up your site to make it more responsive to the reader. Three column websites are not very effective. You are giving your readers too many distractions. "Here's who we are and what we have to offer. Find what you need yourself." Hold their hand and give your readers a personal tour of what you offer. You want them to focus on your most important message first. If you make a connection with them, then will they want to see more. The column on the left tries to show credibility. Why not put that information on its own separate page? This way, you can provide more information and the reader can immerse its mind on the message without getting distracted. To summarize, give your reader one bite-ful of information at a time. Allow their minds to chew on it. The most important message should go top left, then everything else goes to the side or below it. Breaking up your communications into several pages on your site gives you another advantage. It gives you a chance to test and isolate which copy element works best, and which one needs improvement.